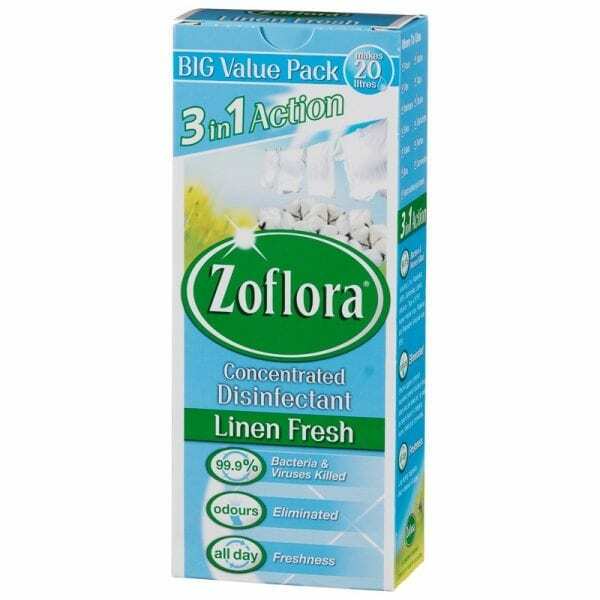 Keep your home or workplace smelling incredible and exceptionally clean with this pack of 6 x 500ml Linen Fresh Zoflora brought to you by Loorolls.com. Suitable for high-traffic environments, this popular concentrated disinfectant has been shown to kill 99.999% of bacteria and viruses. This includes E.coli, MRSA, Salmonella, Listeria, Influenza – Type A (H1N1), Human Herpes virus, Rotavirus and Respiratory Syncytial virus (RSV). It can be used in a multitude of ways – both diluted and straight – before leaving behind a delectable scent that will have guests coming back for another sniff. Pour a cap of Zoflora down drains or plugs, mix with water for a quick antibacterial spray or throw in washing machines to keep them smelling fresh – the opportunities are endless. They are even suitable for use on pet toys and bathroom surfaces.